Like the previous pair, this still life is an early work by the artist, whose first known compositions fall within this genre. Relatively little is known regarding Chardin’s life prior to 1718, the date when he began his training with Pierre-Jacques Cazes as an apprentice, after which he spent a brief period with Noël-Nicolas Coypel. In the 1720s Chardin began to enjoy his first successes, exhibiting for the first time at the Place Dauphine and accepted by the Académie as a painter of fruit and animals, both of which he included in his still life compositions, along with kitchen vessels and other implements. The first still lifes attributed to the artist are simple and austere, both with regard to the type of objects chosen and their limited number, all depicted with a rigorous use of colour. Chardin generally presented these elements on a thick, heavy, stone tabletop, on which he arranged everyday kitchen objects in a practical manner. These simple elements are made of rustic materials such as terracotta, copper, wood, wicker and glass and the artist plays with their colours and textures against plain backgrounds, creating multiple variants that are always structured in a carefully meditated manner. In the case of Still Life with Pestle and Mortar, Pitcher and copper Cauldron, Chardin depicts a wooden pestle and mortar, a pottery pitcher, a small copper cauldron or cooking pot and a fired terracotta dish of a type used for cooking. In front of them in the foreground is a white cloth of a thick weave on which are arranged a handful of onions, potatoes, two eggs and some thin leeks. 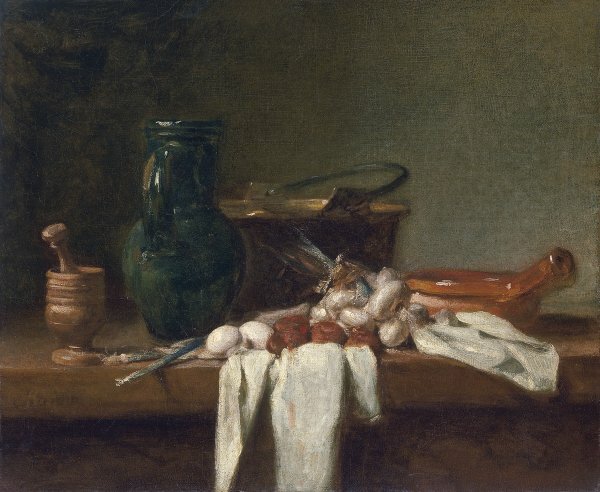 Chardin uses devices derived from northern art to create a sense of depth such as the white cloth that falls over the front of the tabletop or the line of the projecting leeks, which recede into the pictorial space and replace the traditional knife handles that project over the edge of tabletops in Flemish and Dutch art. One of the finest passages in the present canvas is the study of the whites in the foreground, used in different shades in the skin of the onions, the eggs and the coarse tablecloth. In addition to this subtle range of textures and tones we find an interplay of chromatic nuances between the potatoes and the terracotta dish that creates a contrast of warm and cool tones. The wooden pestle and mortar on the left would be used by Chardin in other compositions, as would the pitcher and the copper cooking pot. The canvas is signed and has been dated to around 1728 to 1732. Formerly in the Gans collection in Basel, it was included in the exhibition of works from the Thyssen-Bornemisza collection held at the Neue Pinakothek in Munich in 1930. If we compare this work with others of the same period in which the cooking implements and the foodstuffs are more abundant, it is possible to appreciate Chardin’s outstanding ability to create compositions filled with charm and life through the use of a limited range of modest elements.